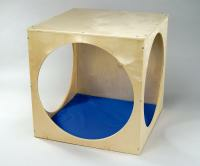 Soft blue floor pad** fits perfectly into our WB0210 Play House Cube. Helps provide cushioning and comfort for your private reading and play area. 28-3/4" x 27-1/2" x 1" thick. Ships UPS or Fed Ex Ground. Made in the USA. Dimensions: 27.5in. × 28.75in. × 1in.